Before the election last November, Dr. Jill Stein held the current record for most votes ever received by a woman candidate for President of the United States in the general election. She is a mother, an organizer, a physician, and a pioneering environmental-health advocate. She helps lead initiatives to fight environmental racism and injustice, promote healthy communities, strengthen local green economies and revitalize democracy. She has helped us win victories in campaign finance reform, racially-just redistricting, green jobs and the cleanup of incinerators, coal plants, and toxic threats. She was a principal organizer for the Global Climate Convergence for People, Planet and Peace over Profit. 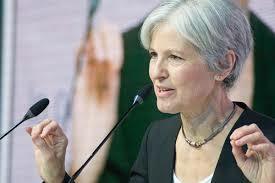 How can Dr. Stein turn the ship of state from war to peace? Jill received several awards for health and environmental protection including: Clean Water Action’s “Not in Anyone’s Backyard” Award, the Children’s Health Hero” Award, and the Toxic Action Center’s Citizen Award. Jill has appeared as an environmental health expert on the Today Show, 20/20, Fox News, and other programs. She also served on the board of directors for Physicians for Social Responsibility. Stein co-authored two widely-praised reports, In Harm’s Way: Toxic Threats to Child Development, published in 2000, and Environmental Threats to Healthy Aging, published in 2009. The first of these has been translated into four languages and is used worldwide as a community tool in the fight for health and the environment. The reports connect the dots between human health, social justice, a healthy environment and green economies. With Trump or Clinton we were guaranteed 8 more years of 27 or more simultaneous and unprovoked wars of aggression against smaller and less powerful nations who did not attack. We cannot continue spending trillions killing millions for billionaires, munitions firms and profiteers. Economists agree this military madness in pursuit of corporate empire will bankrupt the country and destroy the nation between 2020 and 2030. We are teetering on the brink. Our unprovoked aggression has already bankrupted the nation. Hillary and Donalds’ proposals to continue destroying America with avoidable wars for profit are tantamount to treason. In 2020, President Jill Stein can implement The Green New Deal, shut down the wars and rebuild the nation. Next War is not Peace. Ask the victims.